A microphone aka mike captures sound for your computer. Sometimes microphones are mounted near your mouth on a headset. Sometimes they sit on your desk. 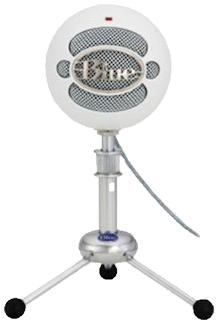 The quality of the microphone is measured by its sensitivity and by the range of frequencies it can pick up. You need very high quality for voice to text applications like Dragon Naturally Speaking. Inside the PC (Personal Computer) case has a lot of electrical noise. You will hear the hum with even a high quality microphone. The way to solve this is to use a microphone with a USB (Universal Serial Bus) connector which avoids snaking the delicate analog signals inside the case. Sometimes a microphone is noise cancelling. It electronically subtracts out sound coming from undesired directions. Sometimes you want a microphone to pick up sound from all directions (e.g. a panel sitting around a table). Other times you want it to pick up sound from only one direction and filter out sound from all other directions (e.g. just you doing a webcast or Skype). 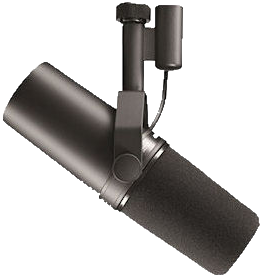 A shotgun microphone is highly directional. An directional microphone accepts sound from just one direction. 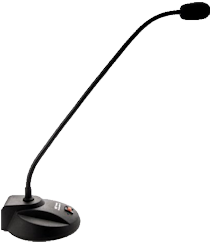 A cardiod microphone accepts sound from all directions except one. An omnidirectional microphone accepts sound from all directions. Hackers can surreptitiously turn on your microphone and spy on you. To defeat them you must disconnect your microphone. USB connection. Comes in 10 colours. Recommmended for creating Youtube videos. 48 kHz/16-bit. Contains three condenser mikes. Driver in firmware. This is a studio mike particularly good for recording deep voices. It needs a preamp.